Forty years after his death, Jimi Hendrix looms larger - and deeper - than ever within the black cultural pantheon. Even though he wasn't really 'black'. When Jimi Hendrix died 40 years ago this season, he wasn’t really 'black'. Oh yeah, everyone could tell he was a black guy by ethnicity (although they might have missed the Cherokee part of his lineage), but he wasn’t seen as a full-fledged member of the black cultural legacy. He dressed too weirdly, he played his guitar too loudly, and he had no discernable connection whatsoever to any black tastemaker or cultural tradition. Hendrix was seen by black people as a rock star, and rock was seen by black people as something that black people did not do. Of course, much of that perception has changed over time. Hendrix’ first major biographer was a black guy, novelist David Henderson (’Scuse Me While I Kiss the Sky, 1978), who added nuance and context to the Hendrix-as-wild-rocker perception. The Band of Gypsies concert album, Hendrix’s only recording with an all-black band, came to be seen as an important piece of the funk canon. His music was widely acknowledged as a huge impetus for Miles Davis’ blasting off into fusion and beyond. By the time Prince emerged in the late-‘70s, picking up with the guitar hero/utopian lyricist/freaky persona thing where Hendrix left off, the tables had been somewhat turned: he got his first radio airplay on R&B stations, while many white rock fans rejected him as a Hendrix knockoff. Later, Charles Shear Murray’s Crosstown Traffic (1987) showed how much Hendrix was influenced, and influenced in turn, by jazz and blues. The release of the compilation Blues showed how deeply his roots in that genre ran, down to the cover art that created Hendrix’s visage from snapshots of all the great blues guitarists who came before him. “Red House”, his most famous blues song, is now as much a part of the blues legacy as “Purple Haze” is a rock standard. 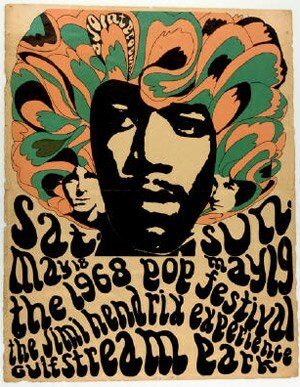 Image: http://images.popmatters.com/features_art/b/becomminghendrix-cvr.jpgNow, Hendrix has been claimed by the black mainstream as a cultural innovator of the highest order – make that a black one. The most recent manifestation of that came back in June, when black history magazine American Legacy splashed him on the cover of its annual Black Music issue, complete with a lengthy Hendrix-for-dummies essay by cultural critic Greg Tate, one of a legion of black writers and artists who came of age in the years after his death and drew inspiration from his life and work (full disclosure: I wrote for previous titles published by the magazine’s founder, Rodney Reynolds – he and I are not related – and my wife has written for the magazine). But back when he died, hardly anyone had the slightest notion that for all his sonic and lifestyle extremes, Jimi Hendrix was very much a product of no less black a tradition than the chitlin’ circuit. Ever since the earliest days of the modern show business industry, the term “chitlin’ circuit” referred to the network of nightclubs and theaters across the country which booked black touring acts for black audiences. It wasn’t a formally organized entity, and many of the venues were far from the beaten track. Not all of the spots held the glamour of New York’s Apollo Theater and other urban black entertainment palaces. But from vaudeville through early R&B, the circuit was an all-black ecosystem where black bands criss-crossed the country from gig to gig, and where black fans could see their stars up close and personal. It’s tempting to assign the chitlin’ circuit to the deep recesses of history, seeing as how the need to have a separate pathway for black acts to tour lessened as mainstream venues became more inclined to book them. It’s equally tempting to see Hendrix as someone of a more modern time and sensibility who emerged wholly formed from some not-specifically-black netherworld and propelled himself directly into the future. But for all his sonic and literal pyrotechnics, for all the things he did that no guitarist had ever done before, his music was rooted in both the good and bad experiences he had in the three years of beating the bushes on the circuit, playing backup guitar for R&B bands that barely tolerated his already emergent musical and sartorial style. Virtually all the Hendrix bios to date cover this period in a couple of chapters, speeding through those formative years on the way to chronicling the years of his global stardom. Becoming Jimi Hendrix: From Southern Crossroads to Psychedelic London, the Untold Story of a Musical Genius (Da Capo, 2010) is the first major fleshing out of the formative period during which Hendrix discovered not only who he was, but who he wasn’t. Hendrix expert Steven Roby (he wrote Black Gold: The Lost Archives of Jimi Hendrix) and writer Brad Schreiber pick up the story with Hendrix’s 1961-62 enlistment in the Army (it was either that or get sent to jail for riding in stolen cars). If you’re having trouble picturing the avatar of ‘60s groovy far-outness being a soldier at Fort Campbell, Kentucky, fear not: Hendrix never did take to military life, and mercifully was given an honorable discharge after about a year of it. Still, it was a fateful time: at Fort Campbell he met Billy Cox, a fellow private who had taken up the bass. Hendrix and Cox became fast friends, and latched on with other musicians to pick up gigs around the area. By that time, it was clear to anyone paying attention that music was Hendrix’s first and only love. Moreover, he had some different ideas about how a guitar could sound, and was already showing signs of the volume and power he’d be known worldwide for in just a few years. But when Cox took Hendrix to a recording audition in Nashville, the man behind the boards, legendary R&B deejay Bill “Hoss” Allen, rejected Hendrix’s wild improvisations. After their respective Army days were through, Hendrix and Cox eventually wound up in Nashville, as part of the house band at one of the major black nightclubs in town. He also picked up some occasional side gigs, and got his first taste of touring on a brief jaunt supporting the personality Gorgeous George, which led to a brief period playing with Hank Ballard and the Midnighters. Brief, because Hendrix was soon fired for playing way more guitar than the R&B star wanted or needed in his band. Thus was the pattern set for Hendrix’s early career. He hated the restrictive style of ‘60s R&B, and bandleaders who couldn’t or wouldn’t tolerate his increasingly confident boundary pushing. He repeatedly rubbed his employers the wrong way, both by his playing and his increasingly flamboyant personal style. But it’s also clear that those years of grinding for little or no pay were important for his development. He started developing the showmanship that would characterize his early concerts with the Jimi Hendrix Experience (while playing a guitar with his teeth or behind his head was part of the shock-of-the-new he brought to rock audiences, Hendrix -- and others – had done it all the time in R&B and blues contexts). And all those years of churning out rhythm parts behind R&B chestnuts night after night sharpened his rhythm playing. Listen to how tight and propulsive his riffs are on the 1967 Monterey Pop performance of “Rock Me Baby”, for example, to get some sense of what his R&B dues-paying bought him. Hendrix would leave Nashville for New York City in early 1964, and much of his career would revolve around New York until he left for London two years later (for his part, Cox would cycle back through Hendrix’s life, and by 1969 became the bass player in his various ensembles). Roby and Schreiber document a remarkably busy and pivotal stretch in Hendrix’s career and life. Their digging through files, interviews and news clippings puts meat on the bones of his pre-fame chronology: the sessions and tours with the Isley Brothers; his sojourn out to Los Angeles and brief collaboration with aspiring singer Rosa Lee Brooks; his combustible tenure in Little Richard’s band; then back east for a stretch with Joey Dee and the Starlighters and recording sessions with Curtis Knight before landing in Greenwich Village and the fateful gig at Café Wha? It was in the Village where Hendrix finally had the freedom to bring all his ideas to the fore, and where he was welcomed into a culturally friendly milieu for the first time in his professional life. Chas Chandler, who first met Hendrix outside a riotous Little Richard gig in 1965, looked him up in the Village in 1966, and gave him the break he’d been hoping for since scuffling around Nashville. The two decamped for London, and the rest is history. Becoming Jimi Hendrix is, in essence, the history before that. Roby and Schreiber are great with names and dates, and make a compelling narrative of the events of Hendrix’s early career. But they don’t quite get us to how his thinking developed, or how the rock-solid foundation beneath the wild, extreme persona took shape. Aside from works like the aforementioned Crosstown Traffic that focus on Hendrix the musician, we’re left to try to piece that out through the stray examples of his early work. On the Isleys’ rave-up “Testify, Parts 1 and 2” (1964), we hear Hendrix beneath an amazing horn section and the three brothers doing their takes on everyone from Ray Charles to the Beatles. We can hear him helping drive the rhythm, then stepping out the maelstrom for a brief, fleet-fingered solo. While the Isleys do their schtick, we can hear Hendrix riffing away in the background, filling in space and keeping things moving. On the strutting “Move over and Let Me Dance” (1965), his sound is even more distinctive even though it’s buried in the mix. It’s clear from these examples that years before the world had heard of him, a shy young guitar player from Seattle had, to a large extent, already become Jimi Hendrix. Like any work of music history worth its effort, Becoming Jimi Hendrix drives the reader to reconsider the music being discussed. The trick in this instance is that Hendrix’s early work exists all over the place. Those two tracks I just discussed came from The Isley Brothers Story Volume 1: Rockin’ Soul (1959-69) (Rhino). The sessions he did with Little Richard is on another comp, the Curtis Knight sessions have been bootlegged to death, and good luck with the Rosa Lee Brooks tracks. But closure on this point is at hand. All of Hendrix’s major recordings from these years will be collected on disc one of the upcoming box set West Coast Seattle Boy (Sony Legacy), a five-cd box of rare and unreleased material due out in November (along with a re-release of the aforementioned Blues cd). This should make clear the sense that, like many a so-called overnight sensation, Jimi Hendrix was years in the making. And virtually all of those years happened where most people least suspected a man who became famous in England before taking America and the world by storm could come from – the uniquely cutthroat, demanding and character-forging world of the touring black musician.